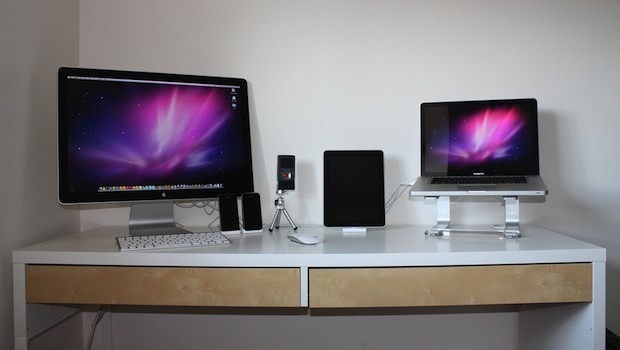 Here a MacBook Pro 15″ is connected to a 24″ Apple Cinema Display, with an iPad, iPhone 4, and iPhone 3G in there to round out the Apple lineup. If you’re not using dual displays with your Mac laptop, you’re missing out on a nice productivity boost and I’d highly recommend picking one up. This Mac setup comes from Flickr. Do I detect a nod to “Ferris Bueller” there? @Derek… I agree. I don’t get why you’d want your MacBook Pro and display so far apart. Mine is set up as shown below except I have since build a matching wood stand to put both monitors at the same eye level.